Lady Sabre & The Pirates of the Ineffable Aether - Chapter 08, Part Four: Launch! Chapter 08, Part Four: Launch! Looking at the PROP on the FLYER, as it begins to whirl. Angle, front of the FLYER. The PILOT and GUNNER/BOMBADIER visible. The PROP is spinning in a blur, and the FLYER is beginning to rock, its tail now off the platform. It’s ready to lift off. TWO AIR CREW are CROUCHING, holding the ROPES that run to the LOCKS around the wheels. They’re both looking to the PILOT. The PILOT has raised his fist to signal ready. The PILOT’S FIST comes down. The AIR CREW yanking on their ropes at the same moment, freeing the FLYER. What’s the guy in panel 3 thinking about? I’m not sure his mind is on the job. 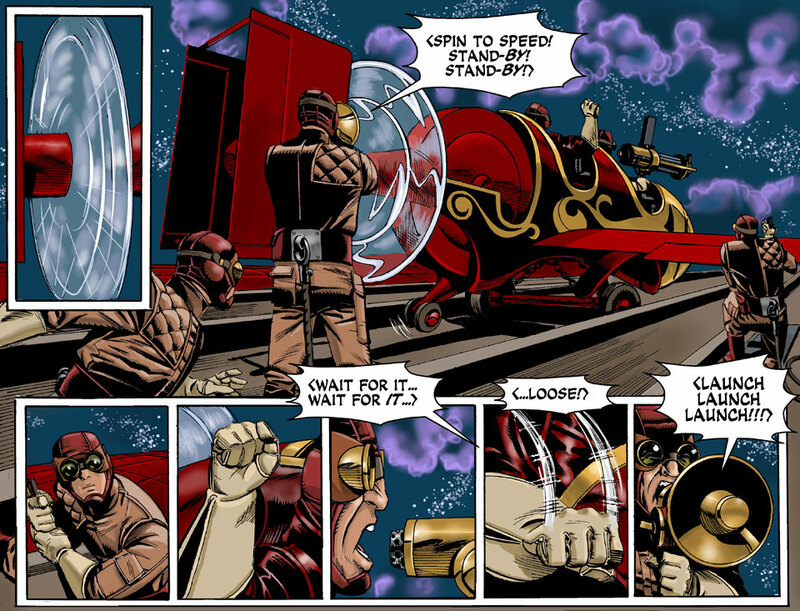 He looks to be waiting for the “go” signal from the pilot — as shown in the next to last panel. BTW, when I read the opening words “spin to speed”, I immediately flashed to Burt Ward saying “turbines to speed”. Ah, the great memories of childhood. I am unwilling to admit that Burt Ward has had any influence in my choice of dialogue. He’s wondering if his messmates have left him any chili-mac. Adam got the game I was going for. No-Prize for Mr. Neace! In all seriousness, just when I think I can’t have any more more fun reading this strip, you guys go and bring in barnstormers. Loving it. Really nice. Hope we get a landing sequence as well, although we may not. They may not be able to land by the time this is over! The sequence of the panels and the way they tell the story so succinctly but so precisely is fantastic here. I dig the pilot’s specs! Since the pilot’s going to attack the Pegasus, what stops him from flying below the ship’s bow then flying upward and raking the hull with as much machine gun fire as he can muster?